The Golden Book of World Records recognised and awarded the Dawoodi Bohra community for undertaking the largest zero waste religious event as part of the community’s Ashara Mubaraka going on in the city of Indore under the aegis of Syedna Saifuddin. 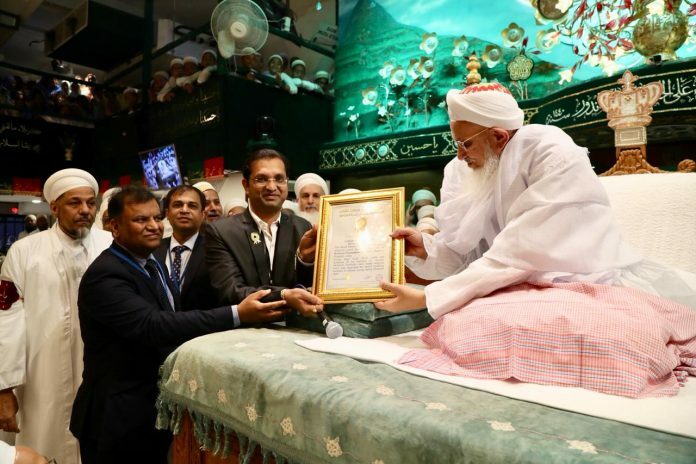 This award was presented to Dr Syedna Mufaddal Saifuddin by Dr Manish Vishnoi, Asia Head of Golden Book of World Records, on wednesday at Saifee Nagar Masjid. The award was given in recognition of the community’s contribution in three categories. Largest Zero Waste religious event for reducing, reusing and recycling waste. Largest Zero Food Waste-based religious event to eliminate food wastage and ensure that not even a single morsel of food goes to waste after meals. Upwards of 1,50,000 people pledging to observe cleanliness. ‘We are extremely honoured and humbled as the Golden Book of World Records recognised our work. In keeping with the city’s reputation of being India’s Cleanest City and as per the teachings of Syedna to maintain cleanliness and hygiene in the neighbourhood, thousands of members of the Nazafat (cleanliness) and Dana (grain) committee teams have been working relentlessly for days to maintain hygiene and reduce wastage of food,’ shared Khuzaima Petiwala local press relations coordinator. ‘We are glad that everyone of the 2 lakh attendees has embraced this cause and contributed in reducing food and plastic waste throughout the event,’ he added. During his recent address to the community members, PM Modi had also appreciated the community’s move of linking Ashara Mubaraka to environmental conservation and cleanliness. Throughout the Ashara event, various activities have been undertaken by the Nazafat volunteers to keep the neighbourhood clean. Regular messages are sent to community members for maintaining hygiene and avoiding usage of plastic bags. Additionally a mass cleanliness drive ‘Lets leave the city cleaner’ was also rolled out today where community members cleaned up streets near Saifee Nagar. Swaha Waste Management company, an IMC accredited company for organic waste management, was also contracted to convert 250 tonnes of organic waste into compost manure.